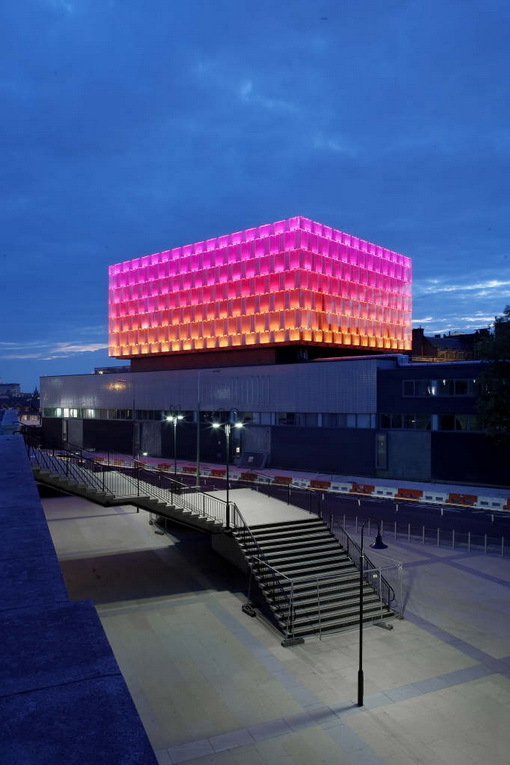 The University of Liverpool was enthusiastic about the idea of illuminating the facade of their Active Learning Laboratory using endless artistic colour scenes to highlight the building’s presence. They wanted to make a statement that the University was not only providing a new education building with first class facilities, but also one which would advertise itself to the City of Liverpool and to the wider audience in an area which surrounds the city from a far. There is also lot of competition to attract students between the University of Liverpool and John Moore’s University and the client wanted this building to “outshine the competition.” Being located next to the Roman Catholic Cathedral, the highest landmark in the City, Arup Lighting proposed the use of rich vibrant, multi coloured images to “paint” the facades with light in order to raise theprofile of the University at night. 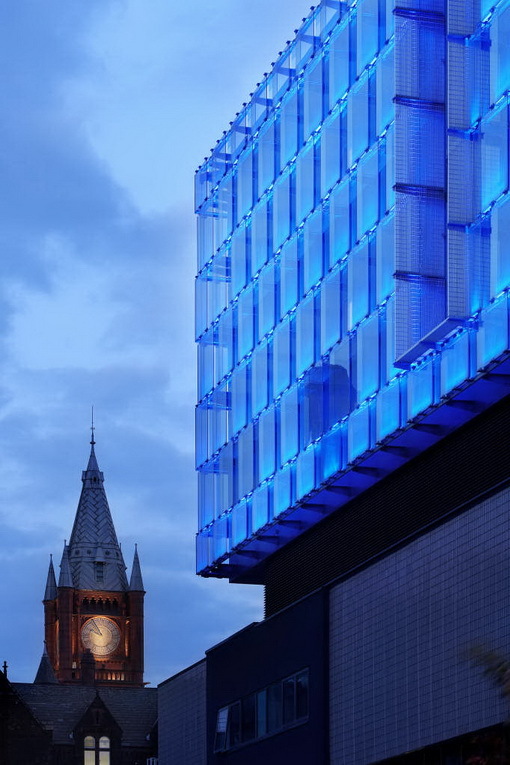 The Active Learning Laboratory façade was developed with Sheppard Robson Architects as part of the University of Liverpool’s Engineering Building refurbishment. The facades 1500 m² of glazing floats 1.0 meter above the main building and consists of alternate rows of 1400 mm dotted pattern and 800 mm clear glass panels on each of the seven levels. A total of 413 No dotted panels provide a highly reflective surface for illumination using specially selected RGB (19212 x 1W) LED linear luminaires. The lighting effects can be programmed to display simple numbers, letters and geometric shapes as well as an infinite array of lights, colour, morphing designs and patterns with selective fading over set time periods.